All across Indianapolis, families are choosing where to send their children to school: the specialized magnet program, the community school closest to home, or the charter school with a college readiness bent. More choices mean new conversations about how extra-curricular offerings, lengthened school days, and summer school programs benefit the 21st century student. Certainly, every child deserves a quality education, but that isn’t enough anymore. Our children also need the resources to ensure they begin school prepared, high-quality enrichment opportunities, and the support to focus in class. In a world that values innovation, the “community center” is one of the oldest social constructs, providing both basic social assistance and enrichment experiences for people of all ages. 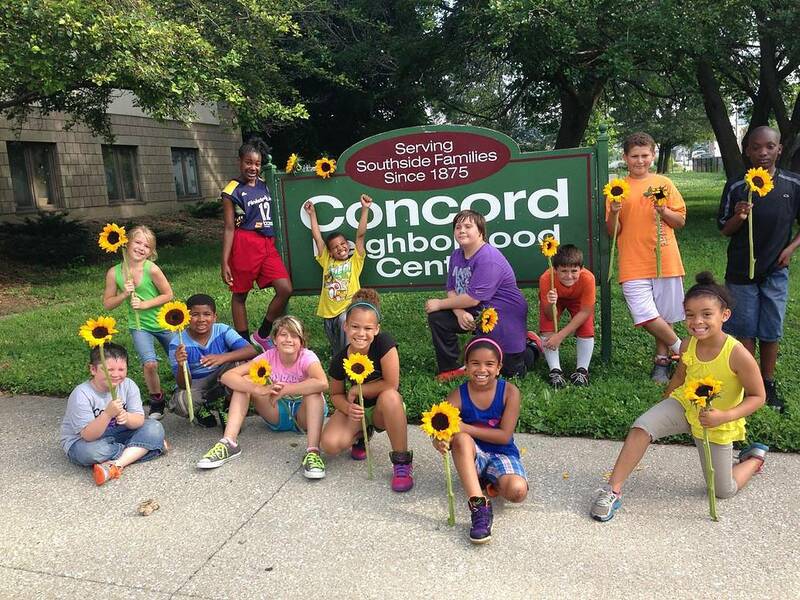 Founded in 1875, Concord Neighborhood Center is the oldest multi-service center in Indiana. Our programs are directed to children and families living on the near-Southside of Indianapolis, but we are just one of a sprawling network of community centers located in neighborhoods throughout the city. Community centers support our youth by being everything a school is not. Through the provision of education, recreation, social and health programs, community centers are a facilitator of basic resources and a complement to classroom instruction. How can we expect our schools to be great equalizers when classroom teachers must juggle a dynamic curriculum with meeting the basic needs of each child? Too many of our students are hungry, tired, and stressed, and these external needs place an undue pressure on schools. Community centers are knowledgeable and well connected—we can meet the basic needs. In the 1940s, Concord’s child and youth programs were offered as basic supervision to working families, removing childcare as a barrier to employment. But early childhood education and out-of-school programs are beginning to adopt quality measures to drive transformative social change. Our licensed, early childhood education center is working to achieve a Level Four accreditation on Indiana’s Child Care Quality Rating and Improvement System: Paths to Quality. The system mandates a credentialed staff, rigorous curriculum development, and standardized evaluations. Our program provides an intensive kindergarten-readiness curriculum through hands-on activity stations. All of our children test “kindergarten-ready” upon graduation from the program, which means they begin school acclimated to the classroom setting and with a working knowledge of foundational skills. Our school-aged and comprehensive teenage development programs follow youth through high school and all the way to college. Our before-school program begins greeting families at 6AM during the week. In these quiet hours of the early morning, children relish the time to be by themselves: to finish a good night’s sleep, double-check the previous day’s homework, or play board or basketball games with friends. From Concord, the children board a bus to school, where they arrive on time, well-fed, and mentally prepared for the day ahead. After school, the kids board the same buses headed for Concord’s school-age and teenage daily programs. Weekly “job club” presentations in our teen program help youth refine their goals. Academic enrichment activities such as a basic engineering project or one-on-one tutoring supplement classroom instruction. We learn board games, walk around the neighborhood for exercise, practice basketball for the local co-ed league, and foster creativity through art projects. A myriad of community partners support our children by providing expert programming related to behavioral management, interpersonal relationships, nutrition and wellness, and embracing the great outdoors. We read the library’s bookmobile books, find new role models in a dedicated cadre of volunteers, and explore different parts of the city on field trips sponsored by the generosity of others. In summer, Concord’s curriculum of education, health, social and recreation programs expands. We dedicate almost 30 percent of the day camp schedule to academic enrichment, provided through daily reading and math exercises. Half a decade into the initiative, community centers like ours have mitigated the infamous “summer learning loss” phenomenon. Our children are no longer losing one to two months of academic instruction during school breaks; if anything, they’re improving their grade level knowledge. For the most part, our success is not measured by quarterly report cards or standardized test scores, so we have more flexibility and freedom than schools. A community center’s impact on each youth participant’s progress and the ways in which we teach them are ever-evolving. Once a child falls behind in school he or she likely never catches back up. But Concord has access to the help our kids and their families need. We have fun, take care of basic needs, and learn new things all at the same time. Because a community center is everything a school is not, we can provide everything else a student needs to succeed in school, in life, and as little people learning to belong to a community. Niki Lynn Girls holds a BS in Human Development from Purdue and a Master’s of School Counseling from Butler. She served as a dean at Arsenal Technical High School before accepting the executive directorship at Concord. Girls planned to stay a few years, but she celebrates 34 years in February. Concord Neighborhood Center was founded in 1875 as a settlement house for German, and then Jewish, immigrants. The agency’s mission is realized through six core programs: early childhood education, school-aged youth development, teenage development, basic social services, HIV care coordination, and seniors and mature adults. In 2015, Concord served over 2200 people. Can Communities of Faith Make a Difference?